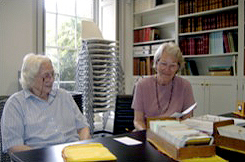 Barbara Green (left), retired Librarian, and Judy Sims, current Librarian, working at 64 The Close. The Sainsbury Institute is a vibrant research hub not only for Japan specialists but also for members of the Norfolk and Norwich Archaeological Society (NNAS). Regarded as one of the oldest and most prestigious archaeological societies in the country, the Institute is pleased to house their outstanding library, which is situated on the ground floor of 64 The Close. In this issue, Roger Billinger, former President of the Society, shares the history and work of the Society and the relationship between the two organizations. A few years after Queen Victoria ascended the throne, at a time when questions were beginning to be asked about science and its relationship with religion, a group of eminent Norwich men came together on a regular basis to talk about the archaeology and history of the County of Norfolk. They brought to their meetings prehistoric flint tools, Roman coins and Saxon pottery and they discussed the prehistoric burial mounds in the countryside, the ancient churches, castles and monasteries of the County. 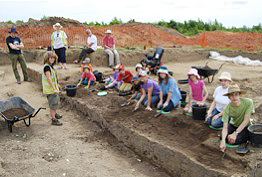 They formed the Norfolk and Norwich Archaeological Society, one of the earliest county archaeological organisations. After 167 years the Society still has the same objectives – to promote the study of history and archaeology, architecture and antiquities. It organises lectures and excursions, issues an annual, academic, peer-reviewed journal, Norfolk Archaeology, sponsors a branch of the Young Archaeologists Club and has a reference library. Society to Helen Paterson in June 2011. Seven years ago the Society was searching for a building to house this library and the problem was mentioned to Simon Kaner at the Sainsbury Institute for the Study of Japanese Arts and Cultures. The Sainsbury Institute quickly and very kindly offered the Society the use of a ground floor room and corridor to house the extensive collection of books, pamphlets, magazines, pictures, photographs, brass rubbings and maps belonging to the Society. 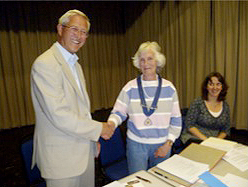 An agreement was signed and the Society moved into 64 The Close in the summer of 2006. Living side by side has resulted in a number of benefits for both the Sainsbury Institute and the Society, each of which have gained from a raised profile in the wider population, both locally, nationally and internationally. The two organisations have the opportunity to disseminate information through their newsletters and to inform their members of various activities through leaflets and lectures. This helps to foster knowledge and understanding between Japan and the UK. In addition employees, students and visitors to the Institute have access to the Society’s collections and to seek advice from the Society’s librarian and assistants. Communication between the two bodies has been valuable and Simon Kaner’s membership of the Society’s council has enabled both institutions to keep in touch with each other. * The collection can be consulted on Monday mornings and most Thursday mornings from 9.30am. Because of the limited opening hours and the fact that much of the collection is tightly packed into cupboards, it is advisable to consult the on-line catalogue (at www.nnas.info) before visiting to ascertain the location of the items you wish to see. We suggest you contact the Society librarian about your intended visit to ensure the library will be open and that your chosen documents will be accessible.